Whether you own a home, a commercial property, or both, keeping a welcoming environment is important. Creating a comfortable environment for your customers, clients or visitors can mean the difference between a repeat visit or a one-time drop in. When you want your space full of natural light and crystal clear views, call our Gorillas for your Brampton window cleaning. 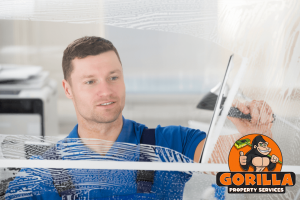 Wiping down windows is an easy enough task but a proper clean takes a bit more work than you might think. When you use basic tools, you get basic results and that is why our Gorillas have stepped our game up. Basic blue cleaners, rags and paper towels might seem like the simplest solution but it is not the most efficient one. The friction that is created from wiping side to side with these materials creates static that attracts airborne dust and debris. What is the point of cleaning off your windows only to have them look dirty as soon as you turn around. By using the right tools, our Gorillas prevent that instant clutter from rebuilding along surfaces. When you are ready for a prolonged clean for the windows around your home or business, let our Brampton window cleaning get you there. 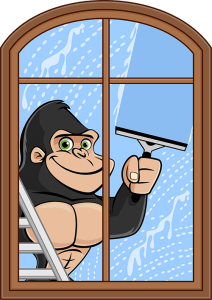 When the windows around your property are within reach, our Gorillas use rubber tools to clean out every corner and angle of the window itself. In addition to cleaning off glass, our Brampton window cleaning service treats your sills and frames as well. In order to keep the interior of your space warm, dry and comfortable, the area around your windows needs to be in good condition as well. Our Gorillas are not limited by heights. Instead of simply accepting that the upper levels of your property as being out of reach, we fight against them with the right tools for the job. Water-fed poles and a mobile water source allow our Gorillas to reach windows up to four storeys in height.